Recall that the localizer portion of an ILS is essentially a VOR with a single radial. Just as a conventional VOR radial extends in both directions from the station, so also does a localizer. Wherever there's an ILS, the back of the localizer beam extends in the other direction. This back portion of an ILS localizer is the basis for what's called a localizer back-course approach. However, although there's always such a back course wherever there's a localizer, there isn't always an FAA-prescribed approach using that back course. 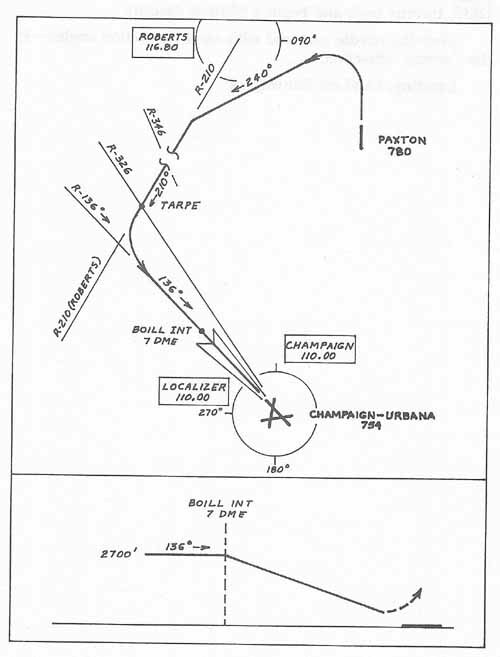 The ILS on Runway 32 at Champaign-Urbana provides for such a prescribed approach—the Localizer Back Course for Runway 14—but the other ILSs on the Flight Simulator disk (at Martha's Vineyard, Snohomish and Van Nuys) provide back courses that you may want to use, to help line you up with the runway. But for those cases, there isn't a prescribed approach procedure, and therefore there isn't a published plate. You'll take off to the north from Paxton, then turn left to intercept Roberts R-210, and will track it outbound, to the southwest. As shown by Figure 4-10, Champaign R-326 will enable you to identify Tarpe Intersection, at which point you'll start a left turn to intercept the localizer. You'll maintain 2700 feet as you proceed inbound to Boill Intersection, a 7 mile DME fix, and at Boill you'll begin your descent to Runway 14. The plate is provided in Chapter 5. Departure. Take off to the north, and, on the climb, come around left to heading 240°. Level off at 2700. Roberts R-210 Outbound.. You're close to the Roberts VOR, so the NAV-1 needle will move quickly. Intercept R-210 and track outbound. Slow down and get set up for the approach. Switch the NAV-2 omni bearing to 326°, for Tarpe. Switch NAV-1 to the localizer (109.10). Set the NAV-1 omni bearing to 136, as a reminder. Champaign R-326—Tarpe Intersection. As NAV-2 centers at Tarpe, begin to monitor NAV-1, and prepare for a response from the localizer needle. Intercepting the Localizer. As the NAV-1 needle moves toward center, turn left to 136° and center the needle. Boill Intersection. Boill is your Final Approach Fix (FAF)—a DME fix 7 miles out from the station. At 7 miles DME, throttle back and begin a 500fpm descent. Keep the needle centered with small correction angles—in the "wrong" direction. Landing. Land on Runway 14.